Since 1937, a little blue can with four yellow letters has been beloved or reviled by diners across the world. Eighty years later, its rectangular contents are making a comeback on local restaurant menus. At Fells Point’s Brick Oven Pizza and Manor Hill Tavern in Ellicott City, Spam is offered as a pizza topping. At Korean restaurants like Tongnamoo in Ellicott City, Spam is served in soups. 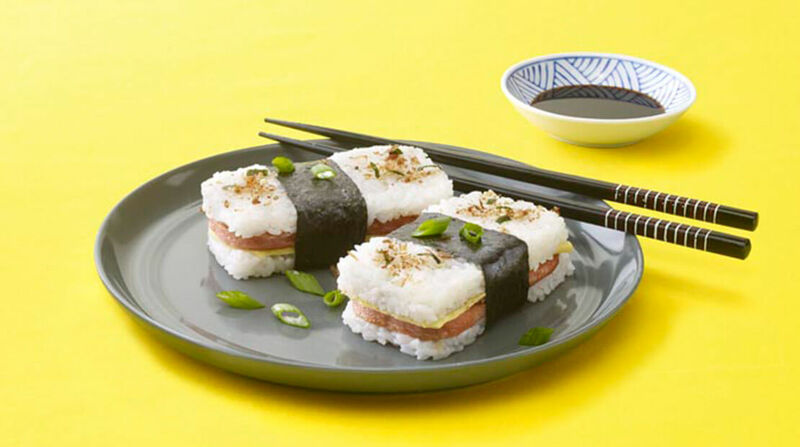 And Spam musubi — a Hawaiian Spam-sushi mashup — makes frequent appearances at sushi restaurants and Hawaiian eateries. Created by Minnesota-based Hormel Foods Corp. in the years before World War II, Spam became a fixture in Hawaiian cuisine when it was brought to the islands by American troops during the war. Hawaii now consumes 7 million cans of Spam per year, according to the brand’s website, and its influence is plain to see in restaurants such as Uncle’s Hawaiian Grindz, which opened a year ago in Fallston.